Nuweiba is known for nature, wildlife, and historic sites. Your plan includes some of its best attractions: see some colorful creatures with a scuba or snorkeling tour, explore and take pictures at Coral Island, explore the gorgeous colors at Duna Reef, and explore the stunning scenery at Coloured Canyon. For reviews, maps, other places to visit, and other tourist information, read Nuweiba trip planner . Chennai, India to Nuweiba is an approximately 14-hour flight. You'll gain 3 hours traveling from Chennai to Nuweiba due to the time zone difference. In April, Nuweiba is colder than Chennai - with highs of 28°C and lows of 13°C. Wrap up your sightseeing by early afternoon on the 10th (Wed) to allow time for the car ride to Dahab. Spend the 11th (Thu) among aquatic life with a scuba or snorkeling tour. Spend the 13th (Sat) spotting exotic species with a safari tour. And it doesn't end there: explore the striking landscape at Blue Hole, look for gifts at Mahmoud's Massage & Beauty, appreciate the history behind Wadi Zaghara, and get outside with Three Pools. For maps, ratings, traveler tips, and tourist information, you can read our Dahab trip planner . Drive from Nuweiba to Dahab in 1.5 hours. Alternatively, you can take a bus. Expect a bit warmer temperatures when traveling from Nuweiba in April; daily highs in Dahab reach 36°C and lows reach 25°C. Cap off your sightseeing on the 17th (Wed) early enough to go by car to Sharm El Sheikh. You'll find plenty of places to visit near Sharm El Sheikh: Hurghada (Swim with Dolphins, Hurghada Marina, & more). Spend the 18th (Thu) among aquatic life with a scuba or snorkeling tour. The adventure continues: browse the different shops at SOHO Square, pause for some serene contemplation at The Heavenly Cathedral, see exotic creatures in open habitats at a safari tour, and make a trip to Musical Fountain Sharm el-Sheikh. To see traveler tips, photos, where to stay, and tourist information, read our Sharm El Sheikh online visit planner . You can drive from Dahab to Sharm El Sheikh in 1.5 hours. Alternatively, you can take a bus. In April, daily temperatures in Sharm El Sheikh can reach 36°C, while at night they dip to 25°C. Finish your sightseeing early on the 28th (Sun) to allow enough time to travel to Luxor. Start off your visit on the 29th (Mon): delve into the distant past at Medinet Habu, appreciate the history behind Temple of Hatshepsut at Deir el Bahari, then stroll the grounds of Valley of the Kings, and finally explore the ancient world of Tomb of King Tutankhamun (Tut). 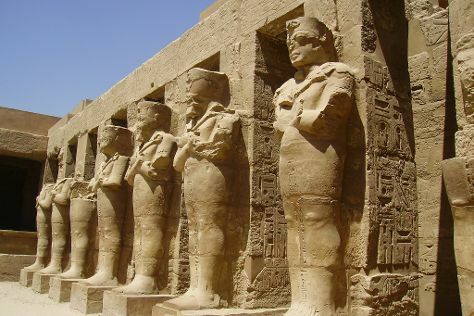 On your second day here, stop by Bait El Ainy, delve into the distant past at Luxor Temple, appreciate the extensive heritage of Avenue of Sphinxes, then get engrossed in the history at Luxor Museum, and finally delve into the distant past at Temple of Karnak. To see other places to visit, photos, traveler tips, and more tourist information, go to the Luxor route maker . You can fly from Sharm El Sheikh to Luxor in 3.5 hours. Other options are to do a combination of ferry and bus; or drive. Expect a bit warmer weather when traveling from Sharm El Sheikh in April: highs in Luxor hover around 41°C, while lows dip to 21°C. Wrap up your sightseeing on the 30th (Tue) to allow time to travel to Praslin Island. On the 1st (Wed), browse the exhibits of Galerie Passerose and then head off the coast to Curieuse Island. Get ready for a full day of sightseeing on the next day: kick back and relax at Anse Georgette, admire all the interesting features of Pearl Farm de Praslin, and then delve into the lush surroundings at Vallee de Mai Nature Reserve. For where to stay, more things to do, maps, and more tourist information, go to the Praslin Island road trip planning site . Traveling by flight from Luxor to Praslin Island takes 13.5 hours. Alternatively, you can do a combination of taxi and flight; or do a combination of bus and flight. Traveling from Luxor to Praslin Island, you'll lose 2 hours due to the time zone difference. When traveling from Luxor in May, plan for a bit cooler days in Praslin Island, with highs around 36°C, while nights are somewhat warmer with lows around 30°C. Wrap up your sightseeing by early afternoon on the 3rd (Fri) to allow enough time to travel back home.